Upfront tl;dr = Motivated witness-team on the lookout for PPY votes. We're Sofie and Tim, a couple of IT professionals and sports fanatics with a healthy interest in blockchain technology. Both of us hold master's degrees in computer science and have a background in software design and server management. Over the last couple of months we've been keeping a close eye on Peerplays, BookiePro and all things BOS-* and decided that we'd like to play a more active role in the community. In our case, and given our background, the most appropriate way to do so would be to become a peerplays witness. On the 25th of october 2018 we launched a proposal aimed solely at the Peerplays Beatrice testnet. This was done deliberately to build and test the needed infrastructure and to get our feet wet. Thanks to the support of pbsa, community manager Senter and the other witnesses we managed to get voted in and things are running smoothly. Ever since we've been working very hard on our setup. This setup follows pbsa guidelines as close as possible and since a lot of components are Python-based we've implemented a WSGI setup to promote scaling and allow flexibility. 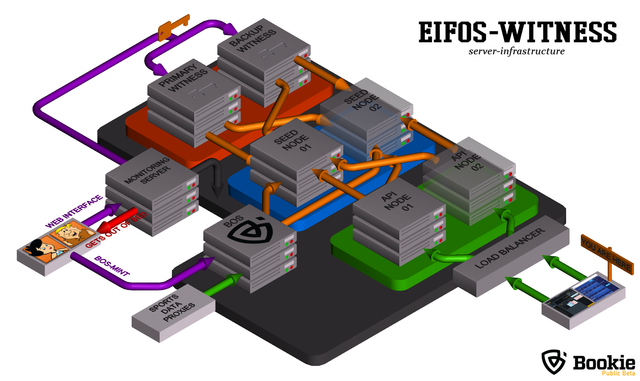 The eifos setup consists of 2 separate witness-servers: a primary and a standby counterpart. The monitoring server constantly checks the status of the primary witness. If anything goes wrong it changes the witness account to allow the standby server to take over. It also sends out phone notifications allowing us to intervene as soon as possible. The API-servers are located behind wss://api-beatrice01.eifos.org and a load balancer is in place to allow future expansion. All nodes use our own seed server seed-beatrice01.eifos.org:7777 as an initial connection to the blockchain. Please feel free to add it to your seed-list. The BOS-mint interface (manual intervention tool) which connects to our BOS-server. The monitoring tool that watches all relevant system processes on our nodes. While building the testnet setup we've gained the knowledge and confidence to launch this mainnet witness proposal. The goal is to fully duplicate (not switch) the current setup and constantly keep working on upgrades and improvements. Now we're looking at you for support. If you like our work and believe in Peerplays just like we do then please give us a vote. If we somehow reach full witness status the block rewards will be put towards server infrastructure and in return you'll receive a dedicated witness-team that will do whatever they can to help BookiePro and Peerplays become a success. Q: What's your IT background? Q: Who's getting out of bed when you're missing blocks? Q: Were you up or down after betting the BookiePro world cup?